Here's one that is not as easy as it seems. In our time, it is no big deal to take a modern pickup and mount it on an old Edison cylinder player. A stereo pickup will take up both vertical and lateral movements and translate them into a nice, clean electric signal. Once upon a time, things were not that easy. 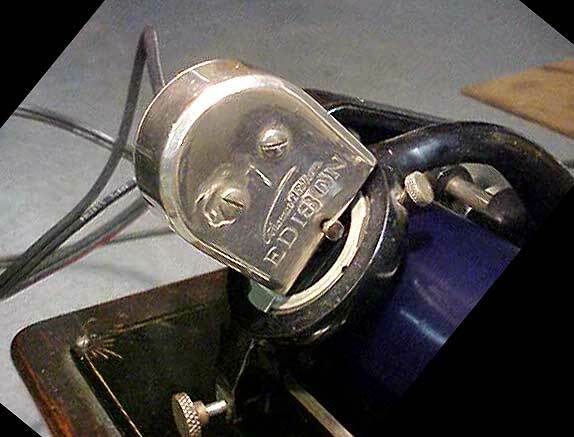 This plug-in for Edison players uses a pickup from an Edison C-4 radio-gramophone, made for laterally cut records. The C-4 was first introduced around August, 1929, which would be the earliest time this reproducer could have been assembled. It was more likely made years later, for who would butcher a new gramophone to use essential parts for experiments? So the problem was: How to make a lateral pickup play vertical records? The solution can be seen in the picture below. The inventor has used parts from several different Edison machines to build his contraption. The pickup from C-4 radio-gramophone, the stylus from an H reproducer, the vertical/lateral linkage is made by soldering the tail end of a stylus bar from an Edison Diamond A/B/C reproducer to a pin. 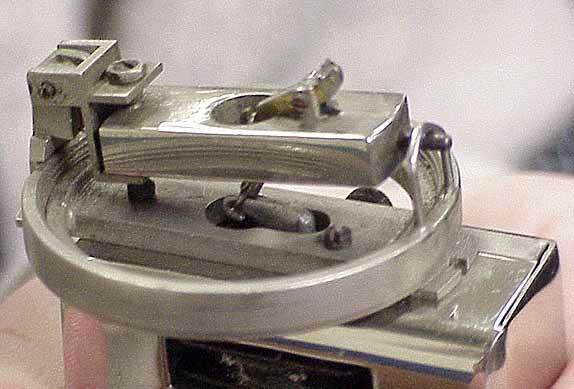 The connection from the stylus bar to the vertical/lateral is made from the eylets and cord from two Diamond A/B/C reproducers. The lower part of the reproducer is made from an Ediphone reproducer, the top of which has been turned or milled flat.